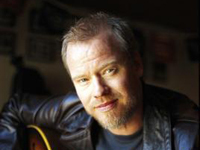 Shawn Mullins, born March 8, 1968 in Atlanta, Georgia, is a singer-songwriter who specializes in folk rock, instrumental rock, and adult alternative music. He is best known for the 1998 single, “Lullaby,” which hit number one on the Adult Top 40 and was nominated for a Grammy Award. Mullins cultivated an interest in music beginning in his days at Clarkston High School in Decatur, Georgia (where he made the acquaintance of friend and mentor Amy Ray of the Indigo Girls). Later, he honed his craft in his college days at North Georgia College and State University as a solo acoustic musician and bandmaster of the military marching band. In dramatic contrast to his present easygoing image, Mullins has something of a martial side in his past. He attended North Georgia College and State University on an Army ROTC scholarship with an intention of possibly pursuing a military career. Although he quickly abandoned this notion in favor of songwriting, the contract nonetheless obliged him after graduation to serve a short term as an inactive Infantry officer in the Individual Ready Reserve component of the U.S. Army Reserve. He served in an inactive status, reaching the rank of 1st lieutenant before fulfilling his service obligation and resigning honorably. Soon, he added a drummer (Mickey Hendrix) and bassist (Carlton Brown) to form the power pop trio billed as “Shawn Eric Mullins with Twice Removed”, a combo that would help carry him to campus-wide and regional notoriety. Eventually the “Twice Removed” trio parted ways under amicable terms, and Mullins began using a variety of collaborative lineups while building his reputation as a solo artist. His critical breakthrough came when his song “Lullaby,” from the album Soul’s Core, became a radio and video hit. One of his more famous songs “all in my head,” was featured on the hit television sitcom “Scrubs.” This song was originally a poem written for his girlfriend, and she made him make it into a song. It was an instant hit, but sadly they eventually broke up. “In the video for Lullaby, directed by Roger Pistole, actress Dominique Swain appeared. Another single, “Shimmer,” was included on the soundtrack for the TV show Dawson’s Creek and was a minor hit. To date, he has yet to match the overwhelming commercial success of “Lullaby,” which was also released as a live performance on the charity album Live in the X Lounge II in 1999 . In early 2002, he formed the supergroup The Thorns with Matthew Sweet and Pete Droge. He supported John Kerry during the 2004 Presidential election campaign, playing a benefit for him in Georgia along with former Senator Max Cleland and others. In 2006, Mullins released his first album on new label Vanguard Records, 9th Ward Pickin Parlor, as well as a new single, entitled “Beautiful Wreck”, from the album. The single enjoyed modest success (surprisingly on country radio), and was featured in the popular Cities 97 Sampler, Volume 18 (his second time being included on the compilation). On March 11, 2008, Mullins released his second album on Vanguard entitled Honeydew. The album was released to stores nationwide, as well as iTunes. Mullins’s earlier work was influenced by acoustic and power-pop groups such as the Violent Femmes, The Producers and the Indigo Girls. However, his most significant and enduring influences are rock singer-songwriters like James Taylor and country musicians such as Kris Kristofferson. His style, most notably in “Lullaby,” shows significant influence from the Blue Aeroplanes. He is known for playing many cover songs during his live performances, including “Copperhead Road” by Steve Earle as well as introducing some lighthearted, quirky elements into his song and stage elements.